The west passage of Narragansett Bay, the most direct route from the south to Providence, Rhode Island, was bustling with vessels carrying coal and other freight in the late 19th century. 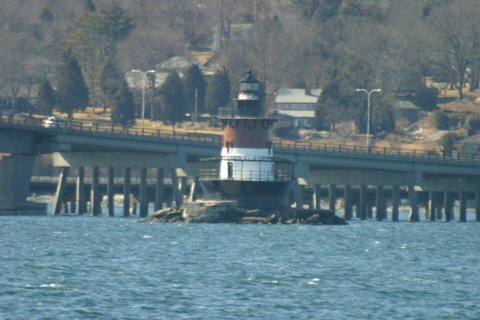 Plum Beach Light was built to help mariners through this busy and dangerous area. When the 54-foot cast-iron lighthouse was finished in 1899 there were not enough funds available for a lens, so for a time a temporary lantern was used. A fourth order Fresnel lens was installed and illuminated on July 1, 1899. The revolving lens floated on a bed of mercury. The Lighthouse Service frequently had problems staffing the lighthouse as many keepers felt it to be a dangerous and isolated location. 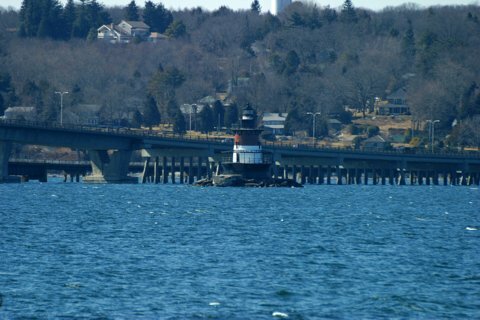 In 1941 the completion of the first bridge between North Kingstown and Jamestown made Plum Beach Light obsolete. Birds took over the abandoned tower. The lighthouse soon lost all its doors and windows and became badly rusted. The Coast Guard claimed that the lighthouse became state property by eminent domain, but the state denied ownership. In 1988 a Massachusetts group planned to buy the lighthouse and moving it to Quincy, Massachusetts, where it was to be converted into a lighthouse museum. A local woman, Shirley Silvia, felt the structure should stay put. Silvia and others founded the Friends of Plum Beach Lighthouse but made little progress due to the question of ownership. Plum Beach Light continued to deteriorate, a battered hulk that seemed more an eyesore than a guardian. In October 1999 the Rhode Island Department of Environmental Management transferred the deed for the 100 year-old structure to the nonprofit organization. The Friends of Plum Beach Lighthouse received $500,000 under the Transportation Act for the 21st Century, known as TEA-21. In August 2000 a team from Newport Collaborative Architects visited the lighthouse. A preliminary estimate of $955,000 for a complete restoration of the lighthouse, inside and out, was made in October 2000. It was eventually decided to move forward with a restoration of the exterior first. In early 2003 a contract was awarded to the Abcore Restoration Company of Narragansett, RI, and work began in late June 2003. The lighthouse is best seen by boat, but there are distant views you can get. At the end of the Jamestown bridge, take the first exit. Take a right onto Helm St. then an immediate right onto Hull St.
At the end of Hull St. take a right onto Seaside Dr. This will take you under SR 138. As you're driving north on Seaside Dr. look to your left for a view of Plum Beach light. We found the best view was at the intersection of Seaview St. and Frigate St.